Objective: Natural orifice surgery is evolving into viable option for surgeons to have in their armamentarium. Totally NOTES operations have remained elusive due to safety concerns. The ability to safely enter the abdominal cavity blindly has remained a challenge therefore requiring one to multiple ports through the abdominal wall to observe entrance into the abdominal cavity. In our clinical NOTES cases we have placed a 3mm trans-umbilical port for visualization of entrance into the peritoneal cavity. In a porcine model we have developed a safe, reliable and reproducible technique for a total transgastric appendectomy. Methods: Five female pigs 45-55 kg were anesthetized under standard IACUC protocols. Using the USGI transport system we entered the abdominal cavity after balloon dilating our gastrostomy site. The transport system was introduced into the peritoneal cavity and maneuvered into the pelvis for a salpingectomy, mimicking an appendectomy. 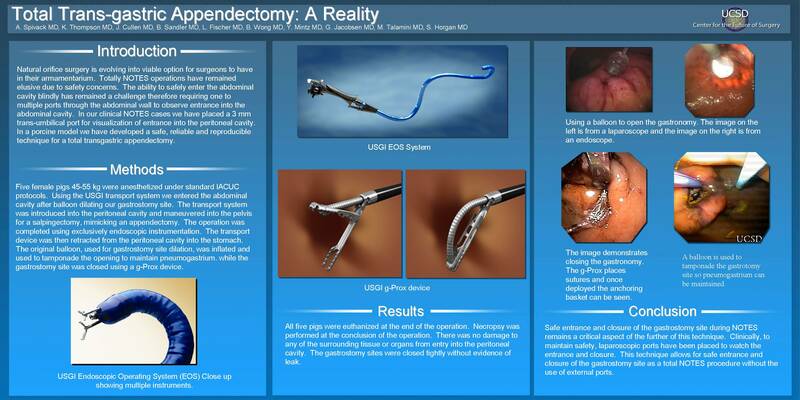 The operation was completed using exclusively endoscopic instrumentation. The transport device was then retracted from the peritoneal cavity into the stomach. The original balloon, used for gastrostomy site dilation, was inflated and used to tamponade the opening to maintain pneumogastrium. while the gastrostomy site was closed using a g-Prox device. Results: All five pigs were euthanized at the end of the operation. Necropsy was performed at the conclusion of the operation. There was no damage to any of the surrounding tissue or organs from entry into the peritoneal cavity. The gastrostomy sites were closed tightly without evidence of leak. Conclusions: Safe entrance and closure of the gastrostomy site during NOTES remains a critical aspect of the further of this technique. Clinically, to maintain safety, laparoscopic ports have been placed to watch the entrance and closure. This technique allows for safe entrance and closure of the gastrostomy site as a total NOTES procedure without the use of external ports.